Happy Day #3 of our Labor Day Triple Hop! 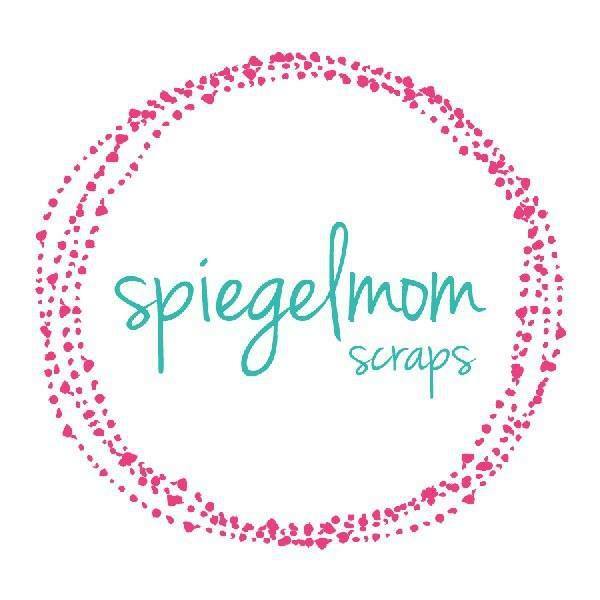 It’s been so fun watching all of our talented designers and designer guests share inspiration for the new SpiegelMom Scraps products! You should have found your way here from Beth’s post. I love seeing how each designer spins her own personality into each prompt. Be sure you click through and comment on every post for a chance to win $10 toward the shop! I knew I wanted to use some soft and feminine paper with the cork hearts I would be featuring. I love how well they pair together! I chose “Central Park” from the Dear Lizzy Saturday collection as my background. I toned it down with some white paint where my photo would be. To give that area a little shine and texture, I used some Shimmerz Dazzlers in Spun Sugar (can you tell how much I love this stuff? I use it on almost every project) along with a stencil. I then splattered a few random drops of Shimmerz Coloringz in Mandarin Mai Tai over my page. I cut out the title and that scribbly circle -which is a part of this month’s cut file pack- with my Silhouette. I used a little Sea U in the Mornin’ Dazzlers to give the circle a pop of color. I tucked a doily from the shop underneath my photograph and stitched some gorgeous cork hearts onto my page. I also painted a few cork stars white and placed them around too! I love that you can still tell there’s cork underneath that paint. I finished off my project with a few additional embellishments and some new exclusive sequins from the shop. This new mix, Autumn Joy, might be my favorite ever. I love Fall so much. Be sure you stop in and swoop them up! Don’t forget to comment! Thanks again for stopping by! If you’ve been with us all weekend, you’re almost done. You’ll be headed over to Sara’s blog next. Very beautiful layout. Thank you for sharing! I love everything about your layout!